Meet the new P3X. It offers almost all of the innovative features we saw in the P5X, but is noticeably lighter and stiffer in just the right spots to provide a much more responsive ride. When Cervélo launched the P5X a few years ago, we applauded the new bike as a new breakthrough in innovations to tri-bike engineering. That’s what the P5X was all about. Lesley Loughlin, Cervélo’s marketing manager for triathlon, had spent years working on the engineers at the company, begging them to come to races to see how triathletes were using their bikes. They listened and, like any self-respecting engineer would, moved to overkill mode, taking thousands of pictures of triathletes riding their bikes at full and half-distance races, then analyzing exactly what those riders were carrying with them. They quickly realized that full-distance competitors liked to carry three round water bottles. They needed space for gels, bars, a spare tube and a CO2 cartridge. They realized (often in horror) that the super-aero bikes they were designing were being slowed down with all kinds of stuff being taped and bolted all over. Which led to the P5X, a bike that was as aero as anything else out there with three round water bottles on it, along with a bunch of gels, bars, that spare tube and cartridge. Heck, there was even space for a spare jacket or vest. You can read our review of the P5X here – suffice it to say it took a while, eventually we came to quite like the P5X, but wished it was lighter and a bit more responsive. The folks at Cervélo were listening. (OK, we probably weren’t the only people who felt that way, but we’ll take full credit none-the-less.) Meet the new P3X, which offers almost all of the innovative features we saw in the P5X, but is noticeably lighter and stiffer in just the right spots to provide a much more responsive ride. So, like the P5X, the new P3X can easily carry three round water bottles without compromising its aero characteristics. You get the same innovative riser system for the aero extensions, but the new design is simpler. You can angle the bars in four positions – 0, 5, 10 and 15 degrees – to dial in the perfect aero position. The base bar is a similar shape, but rather than the two-piece base bar that bolted in place on the P5X you get a one-piece base bar. Like the newly announced P5, the base bar has some Cervélo-branded grips that are very comfortable and seem to provide excellent grip even as your hands get sweaty. The between the arms water bottle cage at the front is now removable if you decide you don’t want that feature, while the bento box remains the same size, but has been modified – there’s no zip on the new version. There’s still a seat-post mounted water bottle cage, along with the option of putting one on the downtube, too. The new P3X is being manufactured at Cervélo’s own facility in Asia, versus at the Hed facility in the USA. This is no-doubt one of the factors in the decreased cost of the new bike. The frame has been modified slightly, but looks very similar to the P5X. The thinner down tube now features an external flat storage kit that sits just behind the front wheel. There’s a new seat post that is considerably lighter than that on the P5X. Overall the bike is stiffer than the P5X – eight percent stiffer at the head tube and 15 percent stiffer at the bottom bracket. It’s also lighter – 16 percent (254 grams) lighter than the P5X. That stiffness and weight loss makes for a noticeably improved feel while riding (more on that in a minute), but you do lose a tiny bit of aerodynamics with the P3X – 17 g to 27 g more drag, depending on your set up, according to the folks at Cervélo. You notice the improved ride and how much lighter the new bike is as soon as you get on the new P3X and start pedaling. It’s that marked a difference. Climbing is much more comfortable on the new bike and it is noticeably more responsive in and out of corners. That new improved feel doesn’t seem to come with any comfort cost, at all. The bike still offers an extremely smooth ride and you can dial in a super-aero position (the most important component to a fast ride), just as you could on the P5X. And, with 36 mm of wheel clearance, you can easily accommodate even a 28 mm tire and still have 4 mm clearance, so you can be even more sure of a comfortable ride on the new frame. As with the P5X, the disc brakes offer outstanding braking in virtually any conditions. Two rides on the bike are hardly enough to be able to make any comments on just how much of an aero penalty you’ll face on the new P3X compared to the P5X, but from what we could see it’s hard to imagine there’s much there. Overall it just feels like a marked improvement on the P5X. I couldn’t imagine a faster bike than the P5X for a bike course like one along the Queen K for the Ironman World Championship. 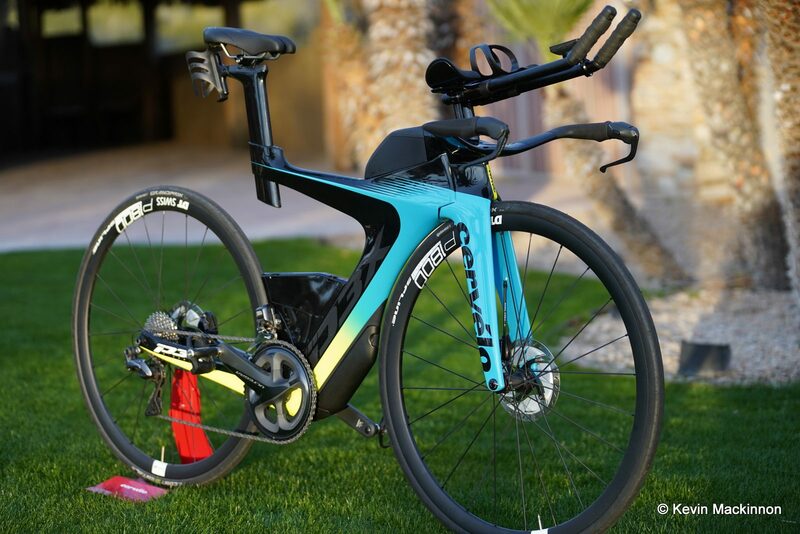 With the P3X the list of perfect courses suddenly got considerably bigger – I can’t imagine why you wouldn’t look at this bike for virtually any full-distance course out there. If you have to carry lots of fuel with you in a race, this bike makes a lot of sense. The addition of the P3X to Cervelo’s line up along with the announcement of the new P5 last week very much puts Cervélo back in the spotlight when it comes to triathlon bikes these days. More experienced riders who like a super-responsive bike and don’t carry a lot with them will likely gravitate towards the P5. Those who are planning on hitting the full-distance race scene with a vengeance will want to have a very good look at the P3X, a bike that now offers virtually all of the innovative benefits we saw on the P5X, but in a much lighter and more responsive package. Add in the fact that it also comes at a significantly lower cost and you have a trifecta of bonus features in the P3X. The P3X will be available in a couple of different packages. The P3X Ultegra Di2 version ships with, of course, Shimano’s Ultegra Di2 gruppo and DT Swiss ARC 1450 48/62 wheels and will retail for $11,500. The P3X Ultegra Di2 2.0 version has the same gruppo, but comes with DT Swiss P1800 wheels. Both models come with various Cervélo branded storage boxes – the SmartPak 600, the Speedcase 600, the Stealthbox 300 and the rear hydration mount.